Announcing Our September 2018 SmartDollar Contest Winners! Have you been looking for exciting new ways to get employees engaged with your company’s benefits? Have you been wishing you had a proven method to help them replace bad money habits with good ones? Contests promote continued engagement with SmartDollar, which results in long-term behavior change. When workers hear about the prizes we’re offering for participating in the program, those who might have stalled in their progress will become more active. Why? Because they want to win! It might start with the smaller goal of winning the contest, but it moves them toward the greater goal of a long-term victory with their money. Whenever a company rolls out SmartDollar, most companies see far higher participation out of the gate than they usually see with a new benefit. And we love to hear that! But there’s always room for improvement, which is another great reason to plug in with our contests. They offer your company a way to jump-start people who are on the fence about joining the program. Ever wondered if personal finance is a bit too, um, personal to discuss at work? A lot of people have that fear. While we’ve seen that most employees do trust their employers for help with money issues, we’ve also seen that many companies are looking for ways to keep the conversation light. Contests are great at this! They’re an easy way for you or your HR team to talk about financial wellness without making it too personal. You’re always looking for ways to motivate your workers to take advantage of their benefits. And here at SmartDollar, we’re always looking for ways to help you make that happen. That’s another reason why contests are a win-win for everyone. When we announce a national contest, your company can participate at no additional cost. All it takes to be eligible for the prizes is your team’s participation with the program during the contest dates! Whether you’re aiming for higher enrollment, deeper engagement, an easy way to talk about money, or an inexpensive way to get their attention, the overall goal is the same: helping your people take control of their money for the long haul. And contests achieve all of that in one package. 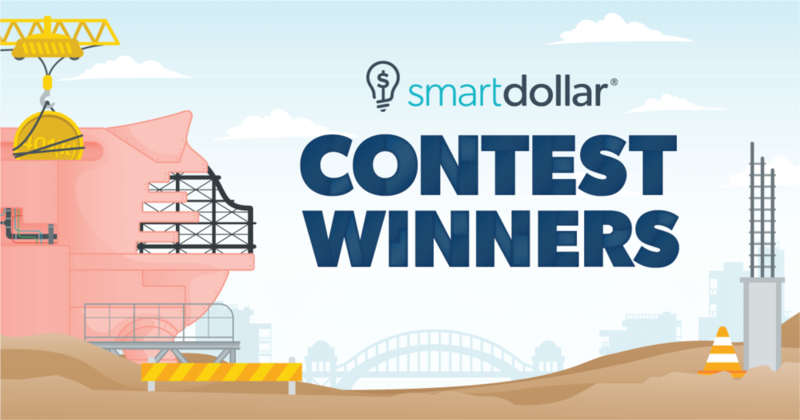 · Each of our finalists received a SmartDollar Prize Pack. · The four runners-up received $100, plus a SmartDollar Prize Pack. · And our grand prize winner received $1,000 cash. Can you say “starter emergency fund”? Ready to learn more about how your company can experience these kinds of results for your own employees? Click our “Contact Us” button to let us know a little about yourself!